Cochran Landscape Management, Inc has been installing and repairing irrigation systems in the Greenville area for over a decade. We promise to work for you and properly install irrigation systems Greenville residents can rely on. The quality of installation is our promise, but we also want to give you great service. Our goal is to make your life easier while making your landscaping more beautiful. Irrigation systems are crucial for larger properties. Technology advancements in irrigation systems have allowed for more affordable systems and more reliable results. 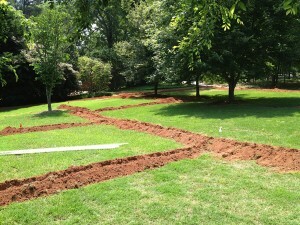 Cochran can install any type of irrigation system Greenville properties might need. We can install automatic or manual sprinkler systems for any Greenville property. Don’t let your landscape dry up, install a sprinkler system to ensure your entire landscape looks its best. There are quite a few options for sprinkler systems, give us a call to discuss what type of system would work best for your property. There are a lot of components that go into the types of irrigation system Greenville properties need. This Home Depot site can give you a picture of all the components out there. At Cochran Landscaping we truly appreciate the opportunity to earn your business.